THE LIGHT FROM BELOW is a site-specific interactive light and sound environment in the cavernous Fort Jay munition magazines addresses our collective culpability in fueling the military industrial complex. The works present phases of a cannon’s ‘life-cycle’ – sale, manufacturing, deployment, firing, and consequence. Visitors interacting with elements are exposed to the corporeality of war and bloodshed. In the profound disconnected from the act of killing in warfare through technology (drones), media spin, and a prevailing societal rhetoric of euphemisms for sanctioned murder, THE LIGHT FROM BELOW intends to reconnect the individual in a simple, meditative, interactive experience. 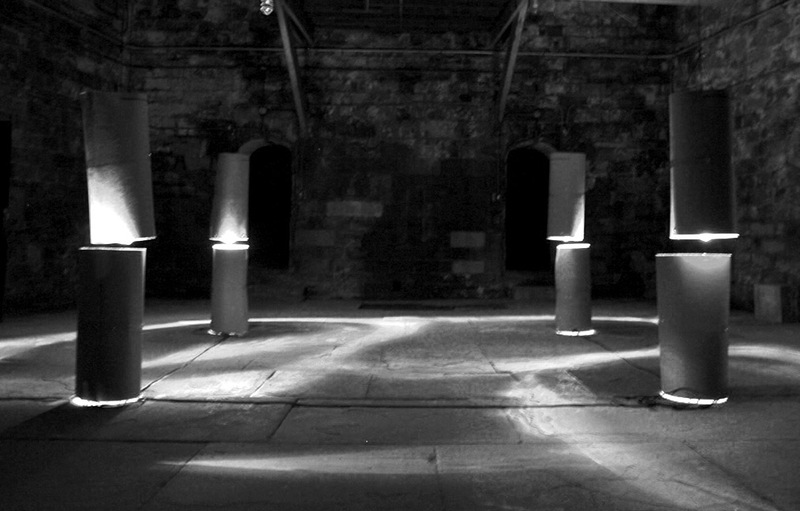 Interactive light and sound installation by Chris Jordan, Jamie Leo, Enki Andrews and Sean McIntyre. Part of the FIGMENT NYC Festvial, held June 7th and 8th, 2014. Installed in the Fort Jay Magazine on Governors Island. Special thanks to Andrea Lindstrom, Colin and Noah of the Parks dept. (and really the whole parks staff), Ester, all the support from FIGMENT, and the Trust for G.I. The Light from Below from Chris Jay on Vimeo.